One of the rare peaceful moments of the last three days in the Bili-Bed. 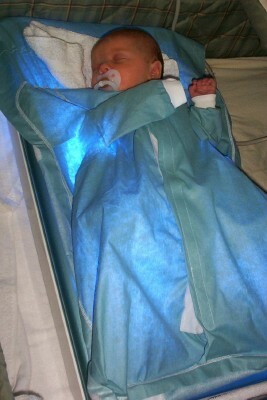 She really hates phototherapy! It's hard to clean up the constant stream of waste that results from lying on a muslin cover with no diaper. Her kicking and screaming smear the mess from head to toe. I've had to resort to a pacifier for the times she's not nursing. The stress of not comforting her in my arms is enough to make me go all attachment parenting. I don't know how those moms and dads with babies in NICU stand it! Oh Meredith, it must be hard to not be able to pick up your baby when she wants to be held and you want to hold her. Too bad they don't make bili lights big enough for you both to be under them. Hope it's not too much longer until Elise's bilirubin levels are normal and this is all a memory. As for the attachment parenting, I want to share my personal experience of initially rejecting it based on what I had seen friends doing with that intention. I was worried about spoiling, no boundaries, etc. etc. But then I met some moms using slings to hold their babies and got a little interested seeing how happy, calm and alert their little ones were almost all the time. So then I read a Dr. Sears book--not the inventor of attachment parenting but certainly a huge proponent--and found that it was way more balanced than I had been led to expect, and that it didn't have any absolutes in it (i.e. they suggest alernatives to pacifiers but acknowledge there are times when they help parents meet baby's need), just suggestions and advice from an experienced, loving attachment parenting dad (and co-author mom, Martha Sears). I especially found the perspective helpful when my son went through two surgeries. They were relatively minor but tough on all of us none-the-less and it was the the being open to finding a way to be there for my son that I had learned from AP that helped us all so much. Sorry I am so long-winded. Hard to remember that my 2 1/2 year old daughter was in one of those when she was born! At least they have this wonderful technology now. When my 18 year old was born, she had to stay in the hospital for 5 days to get rid of her jaundice. Getting the baby to nurse may be a hard task too but it will get better! Wow, I remember how hard it was the one night D2 had to be under the lights. I hope you're all done with it soon! This brings back a lot of memories for me. I worked as an Obstetrics nurse full time before I got married, and I WELL remember how the babies under the billi lights were constantly poopy and just a general mess! And I remember how we often had to clean those special cribs out from top to bottom because the babies got that poopy mess all over EVERYWHERE! But we were always glad,as nurses, when they started doing this because it meant that they were beginning to break down all that excess bilirubin and excrete it. Next week will be totally different than this one has been, and it will seem like a new beginning for you. Do you have to get levels cheked again in the next day or two? I sincerely hope that she is able to come out from under the light soon. She really is a beautiful little girl, Meredith! God bless, and you and your family are in my thought and prayers. This brings back recent memories of my son in the NICU and under the lights. He wore a diaper. Yes it was as horrifying for a new mom as you can imagine. I ache for you, but be comforted that she is home with you. Being around your voice and smell and touch is so good for her. It's really not so bad. Just wanted to update you with what we're doing at home and put a photo so my brother can see what I'm talking about. I'm grateful we can do this in the peace of our own home, at least! I think tonight may be our last night with the lights. As for attachment parenting--no disrespect intended! We practice many of the attachment parenting principles ourselves. It's just funny to me how parents today are encouraged to label ourselves. Pick up any parenting book and instead of advice, you find rigid behavior systems of both extremes...and you are ruining your child in the eyes of one camp no matter which method you choose. Parenting is hard enough without having to join a cult, too. It is very hard to be an aunt with a nephew in NICU. My sister spent all the time she could at the hospital, trying to be close. And we were lucky. After 6 weeks my sister got to take my nephew home. It is very hard to see the long view when you don't know what it is. Praying for you in this difficult time. Thanks for keeping us informed. Lots of prayers and gentle thoughts come your way. Big hugs!!! Not being able to hold and comfort your baby when she cries has got to be one of the hardest things. It just tears you apart. Praying that at the next test the levels are way down and that the Lord gives you strength and peace. I've been there, and I know your pain. Hopefully it will be over soon. Prayers to you! I had no idea that they didn't wear diapers during phototherapy. But rest your concerns about not being able to comfort during this time...I wasn't able to hold my son for the first week of his life because I was unconscious. When I woke up and found out that he was already a week old, I thought I had missed the bonding opportunity. But my fears were unfounded...we've been close ever since. This is exactly what a pacifier is for. Don't feel guilty. You can "misplace" it later when you can be available. You are doing what is best for her even though neither of you are enjoying it. This is the very essense of being a good mother. As for the NICU, I was there for 4 days almost 15 years ago. My goal with each subsequent pregnancy has been not to need to go back even though I am grateful for it should the need arise. BTW my 15 yr old daughter is healthy and happy. One day in the not too distant future this will be a very small part about what you remember of her early baby days. Parenting is hard enough without having to join a cult, too. Just saw your other post that Elise is done with the bili lights--hurray! There's nothing wrong with using a pacifier, you know, if it gives that little sweetie a bit of extra comfort. I hope that she'll soon say 'bye-bye' to the Bili-Bed! Been there, done that, feel your pain. Hubby almost refused to go to the NICU because he couldn't hold her, just look at her. There is a distinctive smell to NICU that you never quite forget. They did a transfusion for our girl and the IV came out. They had to do a new well, so they sent me out while they dug for a vein. Every time the NICU doors opened, I could hear her screams. I'm glad she is doing better. We were able to use diapers for our bili blanket/ and lights for which I am soooo glad. By the way, are you sensitized (I ask because you mentioned the -/+ thing. I got sensitized with my first so that is why the second ended up in NICU with the bili stuff.